Continued from Legal Citation Guide, Part 1. Cases may be reported in several different series, and there is no way of knowing which reporter any given reader will be able to access. For this reason parallel citations are used. A parallel citation simply provides "directions" to other locations where the relevant case may be found. Canadian law reporters are ranked in status as either official, semi-official or unofficial. When including parallel citations, arrange these in order from the most official to least official versions. When citing, use official and semiofficial sources before an unofficial source. 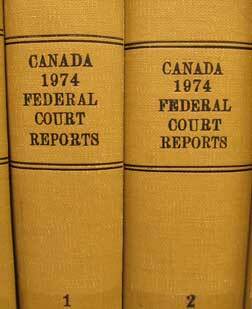 This case can be located in the Supreme Court Reports, Dominion Law Reports or Canadian Criminal Cases. Note that S.C.R. is an official reporter. When a case has gone through more than one court level, it may be relevant to reference the complete case history. While it is possible to begin a citation with any decision, the conventional method is to cite either the final or initial court level and list each decision sequentially from there. Note that the rev'g or aff'g refers to the Supreme Court's action in relation to both of the lower level decisions. Having reviewed the individual components of a legal citation, the notes following the legal citation examples below consider what information is being conveyed in each citation and how you should be able to find each case. This citation indicates that the Queen v. Cognos case was reported in volume 1 of the 1993 Canada Supreme Court Reports, beginning at page 87. The fact that it appears in this reporter indicates that the decision was rendered by the Supreme Court of Canada. This citation indicates that Queen v. Cognos can also be found in volume 99 of the fourth Series of the Dominion Law Reports, beginning at page 626, and that it is a decision of the Supreme Court of Canada. This citation indicates that Queen v. Cognos is reported in the Canada Supreme Court Reports, the Dominion Law Reports (4th series), and also in Canadian Cases on the Law of Torts (2d series). It must have been a decision of the Supreme Court of Canada since the first citation is to the S.C.R. This citation indicates that the 1993 decision from the Supreme Court of Canada reversed the 1990 decision from the Ontario Court of Appeal, but affirmed the 1987 decision of the Ontario High Court of Justice. The most recent decision is reported in 3 different law report series: the first appeal decision is reported in 2 different series, and the trial level decision was only reported in one law report series, the Ontario Reports (2d series). The square brackets in this citation refer to the date upon the spine of the reporter where the case is located. The dates in round brackets tell us the actual dates those decisions were handed down. This citation indicates the 1978 decision of the British Columbia Supreme Court was affirmed by a 1980 decision of the B.C. Court of Appeal (which is reported in volume 15 of Canadian Cases on the Law of Torts). Leave to appeal was refused by the Supreme Court of Canada in 1981; this decision can be found in the C.C.L.T. and the National Reporter (N.R.). Only cite a case using a LexisNexis Quicklaw, Westlaw Canada, or CanLII identifier in the event that it does not have a citation to a print reporter. If a print citation exists, it should be used. If the case has not been reported in a print reporter, use the neutral citation (if there is one) in preference to the database's own identifier. This case was not reported in any print reporters. It had a case identifier assigned by Westlaw Canada, but this was omitted, as it also had a neutral citation. The date, court and court level (British Columbia Court of Appeal) are apparent from the neutral citation, so those elements do not need to be added to the citation. The "WL Canada" indicates that the case was retrieved from Westlaw Canada. This case was not reported in any print reporters, and it has no neutral citation. Therefore, it is cited to the case identifier assigned by LexisNexis Quicklaw. The "O.J." indicates that it is a case from Ontario but does not indicate the court level; therefore, the "Gen. Div." is needed at the end. Finally, the "QL" shows that the case was retrieved from LexisNexis Quicklaw. Note that it is not necessary to include the court because it is clear from the database that this case was handed down by the Supreme Court. Here, it is evident that the case was decided in Alberta (database abbreviation A.J. ), but it is unclear which court heard the case, so the abbreviation must be included. The identifier shows the case is from P.E.I. but does not indicate the court; therefore, the court abbreviation had to be added. The identifier also indicates it's from Westlaw Canada, so there is no need to add that information at the end. The only additional information needed is the court and jurisdiction; the identifier gives the year and electronic database information. Legal materials, including full text cases and statutes, are often available for free on the internet (as opposed to through subscription services requiring passwords). It is always better to cite a case to a printed reporter, or a database, than simply to an online document. However, when it is your only option, Legal Citations, or print citation dictionaries such as the McGill Guide, offers direction as to the proper citation for electronic materials. Stephenson v. Stephenson (6 December 1984), Nanaimo 5920/004143 (B.C.S.C. ).